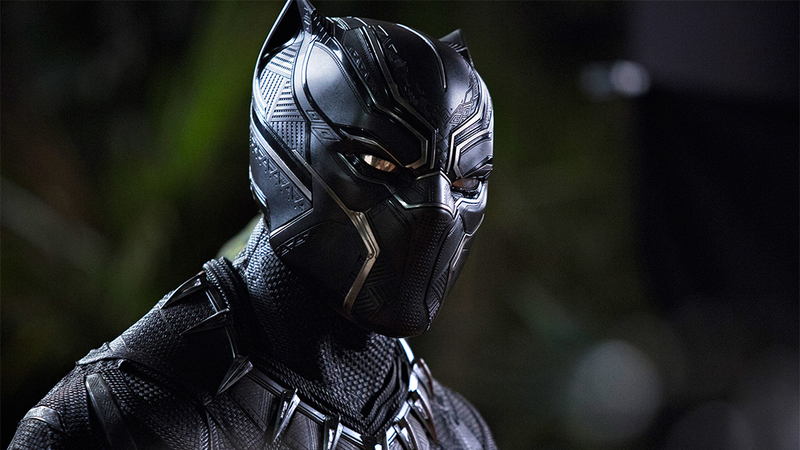 Chadwick Boseman reprises his role as T'Challa (a.k.a. Black Panther), Prince of Wakanda, a fictional country in Africa as envisioned by the Marvel Cinematic Universe. We first met Black Panther in 2016's Captain America: Civil War, where we also witnessed the death of his father King T'Chaka (John Kani) after a bombing of an international conference in Vienna. The opening passages of Coogler's film remind us of this tragic event, while also providing some flashbacks to T'Chaka's younger years, giving us context for some important plot developments. The editing by Debbie Berman and Michael P. Shawver keeps the flow of Black Panther moving swimmingly and the picture is greatly enhanced by history-making Oscar nominee Rachel Morrison (Mudbound) who photographs both daytime and nighttime sequences with striking clarity. So what's not to love? Well, for all of its sleek, shiny production value and sound design, it's really a low-key messy film. At times it wants to be a message movie, commenting on the disturbing lack of resources in undervalued parts of the world, including tough inner city neighborhoods (like the ones in Oakland, California). Then it also wants to be a timeless tale of fathers and sons and those sons carrying the sins of the father. And during the middle stretch it's a Mission: Impossible globe-trotting espionage flick. Now a big superhero movie can be about all of these things, definitely. But in Black Panther all of these passages are undercooked and yet are smartly veiled by its skilled cast of actors. So what we're left with are awkward changes in tempo, and thus a diminishing of any emotional payoff. The one aspect that thrives through it all, is the performance by Michael B. Jordan, who plays the villainous and aptly named Erik Killmonger. He doesn't seem to care about the jaggedness of the film; he just pushes forward with furious conviction, making him always compelling. But there's also a lot to admire in the movie. Boseman is a good choice for the Black Panther character because he has the eyes of someone who is essentially a good person. He gives an anchored presence to supplement the weightless CGI version of Black Panther who's jumping off of cars and out of futuristic jets. The costume design and the sets are striking and unquestionably impressive. The action is fun, although I could've traded one of those ritualistic bouts for another action set-piece like the spectacular fight sequence that takes place in a South Korean underground casino. It's here where the character of Okoye (Danai Gurira, who was terrific in 2007's The Visitor) shines and walks off with being the film's true badass. It's a terrific fusion of camera operation, music and fight choreography. On a cultural level, while it may not live up to the merits of its overhyped Rotten Tomatoes percentage, we urgently need a movie like Black Panther. It's a big, well-made movie about a superhero who is black -- at a time when our nation has a president who endorses racism and bigotry and promotes white supremacy. Consider: 90% of the film's cast are either African American or other persons of color. They all deliver good performances. They play strong women. They play strong men. They play loving mentors. They endorse family and loyalty. Do you know how many young viewers are going to look up to this movie? They'll buy the toys. They'll rock the lunchboxes. They'll wear the Halloween costumes. Now, I admit to having superhero movie fatigue these days, but if Hollywood is going to spend $200 million dollars on a movie, I'd rather them make more films like Black Panther. In the end, it uses the platform to promote positivity and using power for the good of man. Overhyped or not -- I'm down with that.